From time to time there’s a need to produce large quantities of certain polygons. An example is something like the work on the right: using squares, hexagons, rectangles, etc., etc. to make and name fractions. One way to make polygons is with a die cutter. This is slow and wasteful of paper. Here are some templates that you can use to cut large quantities of triangles, hexagons, and rhombi with a paper cutter. If you print a copy of each sheet, you can staple it to 5 sheets of blank paper to hold everything in place while you make the cuts. Place the staples as shown in red so they’re not in the way of the paper cutter blade. For the triangles and hexagons, make the first cuts horizontally, and then you can cut each shape one at a time. For the rhombi, just make the longest cuts first. Squares and rectangles, of course, can be made on a paper cutter without using a template. Circles, as far as I know, need to be made with a die cutter or similar device. 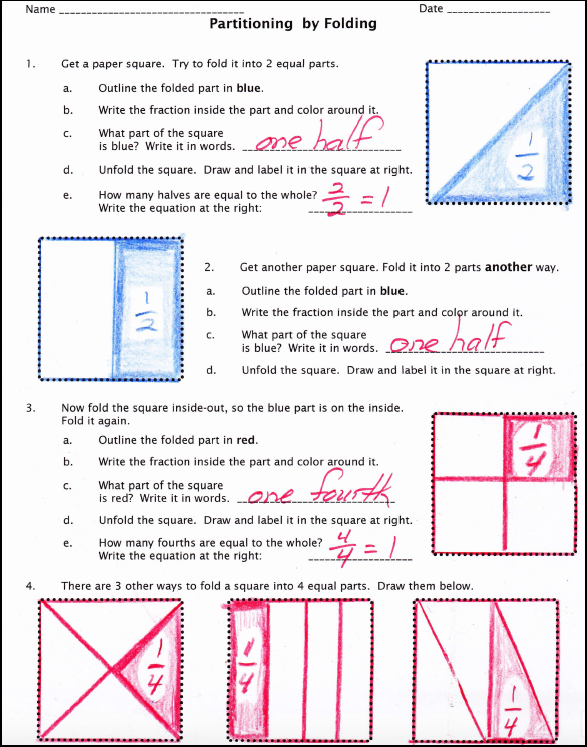 The introduction to fractions through paper folding shown above is on my TPT store here.